Only about 25% of motorcycle accidents are single-vehicle accidents involving the motorcycle colliding with a fixed object in the roadway, which puts into perspective how many accidents occur involving another motor vehicle. The failure of motorists to detect motorcycles in traffic is one of the leading causes of these accidents that can be both serious or fatal. (1) You may wonder what you should do after you have been injured in an accident, what serious injuries you may sustain, and so much more. Luckily, we are personal injury attorneys who know and understand motorcycle accidents and can help you every step of the way in the process. Head-on Collisions: Believe it or not, motorcycles and vehicles make up for more than half of the accidents that occur and lead to motorcycle fatalities. In many of these accidents, the car will strike the motorcycle from the front. Many of the accidents that occur between motorcycles and vehicles are fatal because motorcyclists do not have the protection that vehicle drivers do. Left-Hand Turns: This is the most dangerous accident that can happen involving cars and motorcycles. When a car makes a left-hand turn, it will typically strike the motorcycle as it goes straight through an intersection, passes the car, or tries to overtake the car. Being that they involve a motorcycle, they become deadlier because the motorcycle’s smaller size makes them less visible. The “good” news (if there is any in these situations) is that the vehicle will almost always be found at-fault for the accident. Lane Splitting: This takes place when a motorcycle drives between two lanes of vehicles when they are stopped in traffic. This occurs frequently because of the close proximity of the vehicles, the reduced space to ride, and the fact that cars do not anticipate motorcycles riding this way. In some states, lane splitting is permissible, but in others it is illegal. This will make the determination of fault in an accident. Speeding and Alcohol Use: Many accidents each year take place due to negligent actions such as speeding and alcohol use. 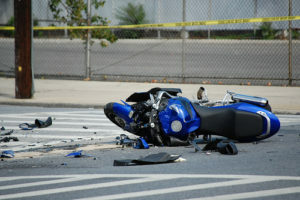 Crashes involving speeding or alcohol are more likely to cause death to a motorcycle rider than a vehicle driver. The truth is, many of these accidents happen due to motor vehicle drivers not paying close attention to the roadways. However, some of them will happen due to rider inexperience and lack of familiarity with the roadways or how to properly navigate a motorcycle. Many riders will find that motorcycles require much more skill and physical coordination to operate than a car. All riders must anticipate the limitations of a motorcycle and how to control their vehicle when they are learning the rules of the road. One of the most important things that a motorcycle rider must remember is that their motorcycles offer little protection. This is why it is especially important to wear protective gear like helmets, eye protection, and protective clothing to keep them safe at all times. This is vital if they come into contact with the roadways, where injuries will almost always occur. Now you can discover some of the most common injuries that come from these accidents. Bone Fractures: When you are involved in a motorcycle accident, you may find that the motorcycle tips over, causing you to fall with it. Because of these accidents, part of the rider may remain underneath the motorcycle, which could result in broken legs and other body parts. In studies, it has been shown that trapped and broken legs are one of the most common injuries for motorcycle accident victims. Wrist and arm fractures can also occur very easily, as riders will attempt to catch themselves when the motorcycle starts to fall. Road Rash: Skin-on-road can occur when the motorcycle accident victim falls off the motorcycle. This happens especially when a rider fails to wear protective clothing to keep them from obtaining road rash in the first place. Road abrasions can be very minor or extremely severe in nature. First-degree road rash may make the skin appear red, but third-degree rash removes the skin and leaves layers of fat and tissue exposed. If you are looking for a personal injury attorney who knows the ins and outs of the law dealing with motorcycle accidents, today is your lucky day. At RAWA Law Group, we have handled many personal injury accidents and can help you get compensation today. Just give us a call to get started on your claim.